LAPERTI POOL CUE BAG DESIGNED FOR 8 SHAFTS & 4 BUTTS This luxurious Laperti cue bag is square shaped and lined and padded with a soft black fur style material. Strong and resilient suedette exterior with carrying handle and shoulder strap. Not one, not two but five exterior pockets for accessories, e.g. towel, chalk, tip tools. 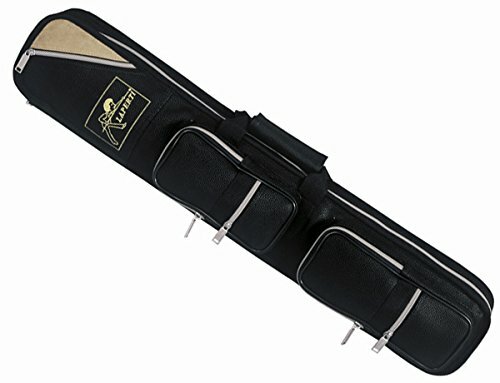 This cue bag is extremely portable and will offer your cue, valuables and accessories excellent protection. A truly professional American pool case that will hold up to four butts and eight shafts. With the ever changing nature of the game the need for larger bags to carry your choice cue, jump and break cues has been met here with this stunning bag. If you have any questions about this product by Laperti, contact us by completing and submitting the form below. If you are looking for a specif part number, please include it with your message.